Monitor Lighting are an East Anglian based firm of event lighting specialists. Whether your function is in Ely, Cambridge or Peterborough we have the tools and team to deliver top level service from our local operations base. With a multitude of experience and successful events behind us, Monitor Lighting are the perfect choice to light up your gathering in Cambridgeshire. Provide an atmospheric depth with a star cloth. This lighting technique appeals on a number of levels by virtue of it’s adaptability. Our star cloths can be used to deliver a glamorous backdrop for your top table or band, line the entrance to your ballroom with showbiz sparkle or on a functional level used to hide an area of your venue or equipment which detracts from the mood and finish of your room. Producing a pleasant and enticing light, lanterns are a beguiling illumination perfectly suited to outdoor functions and parties. 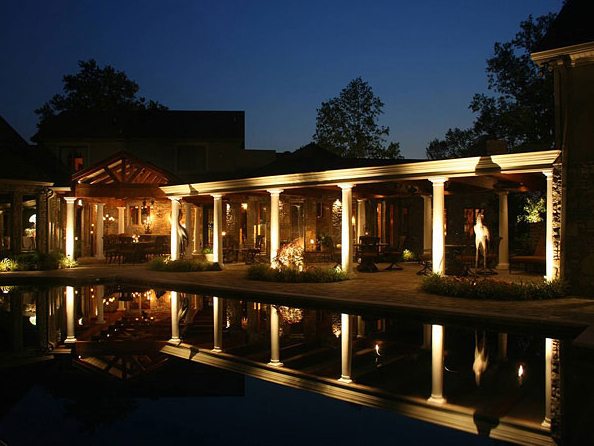 They can deliver the necessary lumens to keep the situation bright, yet still provide the subtlety of mood lighting to keep your guests feeling relaxed and in the mood to party. Used economically, they are a friendly feature when deployed at your venue coming in a variety of sizes. On the other hand, you may apply a uniform size and consistent plan. However you imagine their use, Monitor Lighting can magnify your inspiration. Our uplighters have been the backbone of a host of functions throughout the Cambridgeshire area. Another delightfully versatile piece of equipment, the uplighter can be used expansively to cast your choice of colour across a vast area from multiple sources, or distributed more sparingly to be used as a focal point. Our modern LED units produce almost no heat and are the choice for the greener customer since they are tremendously energy efficient. Do you want to emphasise the importance of your dancefloor and entice even more party goers to use it as you light up your part of Cambridgeshire? Take a look at our multi-coloured and LED dancefloors. Monitor Lighting give you the choice to bring back 80’s colour explosions or reproduce 70’s cool. Fully programmable and with all the control you might need, these units take slightly more setting up however they deliver even more excitement and fun to the centre of your event. As well as our modern lighting choices, Monitor Lighting stand by the possibilities of more traditional offerings that have delivered so much to so many Cambridgeshire functions. We offer bespoke options sized to suit any venue from a dining room which is to be transformed into a party hub, to a banqueting hall which will be the stage for a romantic first dance. Our install method is swift and includes anti-trip edging. Intricate, evocative and beautiful, a fairy light canopy has the capacity to produce an enticing ambience. Traditionally used in a subtle fashion they can alter the feel of sections of your venue and deliver warmth and vitality. Bring a canopy to your Cambridgeshire event and add a magical light to your function. Over the years Monitor Lighting have delivered stunning lighting installations to a varied array of events and functions throughout Cambridgeshire with delightful results. Every option Monitor Lighting offer in Cambridgeshire is delivered and installed by our dedicated staff who bring the experience of years in the industry and a professional, personable attitude. Make contact with Monitor Lighting by clicking here and start the exciting process of realising your illumination masterpiece. Whatever event you plan to unleash on Cambridgeshire, we have the tools and technical acumen to help you deliver a night to remember for your party goers.